Yesterday was officially the last day for registration for the 2015 Spartan Invitational Ball. Starting today, all entries will be subject to a late fee, and may be denied if a late add would change the day’s schedule. Thank you to everyone who has already registered — we can’t wait to see you this weekend! Welcome back, dancers! The new semester is here and we hope you’re as excited as we are for the good times we have ahead. We’re very excited to announce our coaches for the 2015-2016 school year: Roberta is back for standard and smooth, and we’ll be welcoming Joanna as our new Latin coach! Roberta’s classes will start at 4pm, with smooth from 4-5 and standard from 5-6. Joanna’s Latin class will be from 6-7, and from 7-8 the room will be open for workshops and open practice. 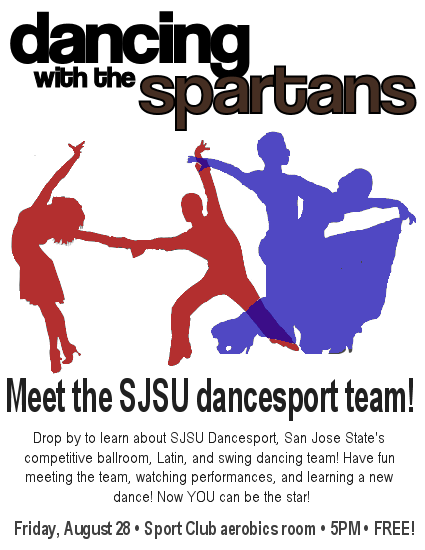 Stay tuned for information about our upcoming recruitment / party / mixer day, Dancing With the Spartans, which will take place this Friday, 8/28. See you all there!! 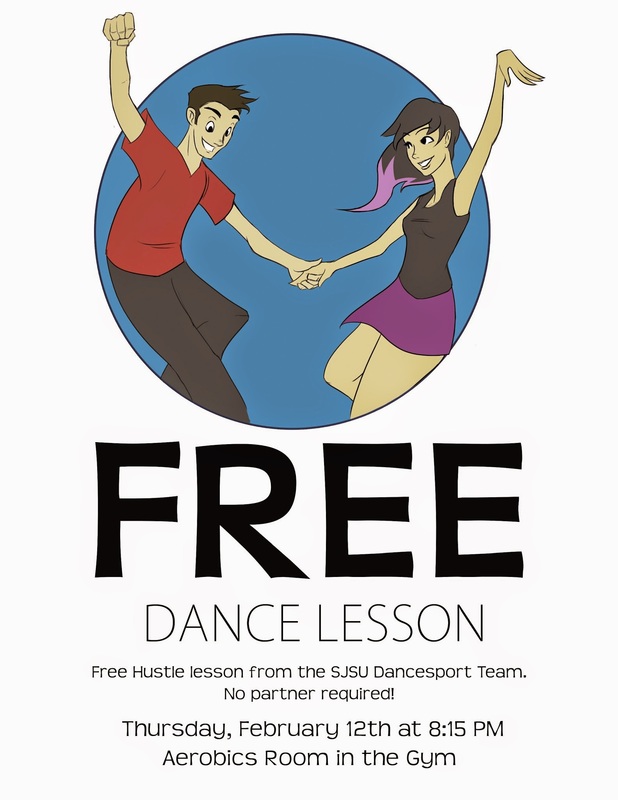 We’re kicking off our social dance classes with a FREE hustle lesson! Drop by the aerobics room in the gym (Sports Club) at 8:15 on Thursday, February 12 for a fun lesson on one of the most versatile dances out there — nightclub hustle. Bring your valentine! Bring your friends! Bring your parents! Bring everybody! (Note: if said friends / valentines / parents are not SJSU students, they’ll have to pay $5 to get into the gym, making the lesson free-ish instead of free. Sorry; that part’s out of our control).